The transition from ICD-9-CM Volume 3 procedure codes to the ICD-10-PCS coding system is proving to be very challenging for coders. Guidelines state that it is not the responsibility of physicians to change the common procedural terminology they use to document their procedures but is instead the responsibility of the coder to take the surgeons procedural language and translate it into ICD-10-PCS codes. 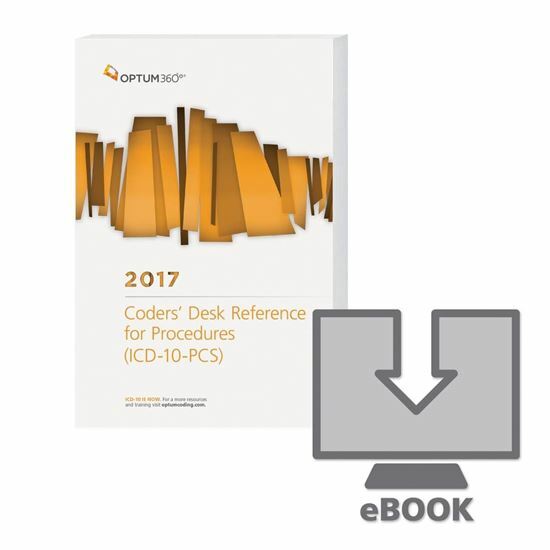 The 2017 Coders’ Desk Reference for ICD-10-PCS Procedures has been developed to address this challenge. Organized by ICD-10-PCS common procedural nomenclature used in the hospital setting and linked to the related root operation table(s), the procedure is described in layman’s terms, translated to ICD- 10-PCS root operation terminology, and the corresponding root operation table(s) is identified. Optum360 Edge —Lay Description.Lay descriptions are provided for the most commonly performed inpatient procedures. Corresponding ICD-10-PCS root operations are identified and defined. • Optum360 Edge — Clinical Focus Points. When more than one root operation may apply key procedural terms differentiating the root operations are highlighted in focus points to ensure that the correct root operation is selected. • Optum360 Edge — Illustrations at the chapter and code level. Often an illustration is needed to enhance understanding. Illustrations of pertinent anatomy and surgical procedures are included as a visual aid. • Organized by Common Procedural Nomenclature. Locate information quickly with a resource developed to work hand-in-hand with your Optum360 ICD-10-PCS code book. • Enhance Understanding of ICD-10-PCS. The lay descriptions were developed to enhance understanding of the ICD-10-PCS terminology and definitions of root operations, body parts, approaches, devices, and qualifiers.